We are looking for feedback/ideas for potential projects to assist Kiribati. Please email us your ideas. 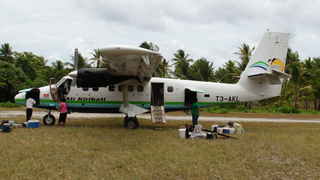 It is generally difficult moving around Kiribati. Time, planning and patience are needed. 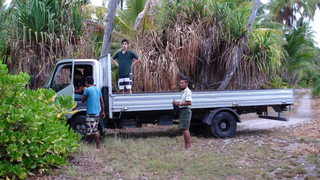 Shipping services are available between most of the islands in Kiribati. They transport passengers, cargo and vehicles. Allow room for the unexpected especially with domestic air services and inter-island shipping and ferry services. As well as this, the sea transport throughout the islands is tide dependant therefore vary regularly. 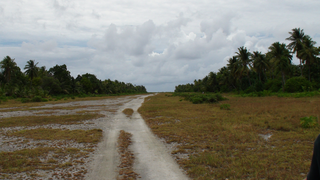 There are no taxis in Kiribati. Most of the outer islands do not have motorised vehicles. The only way to get around these areas is on foot or bicycle and occasionally motorbikes. Ships operate from South Tarawa to some of the outer Gilbert islands. 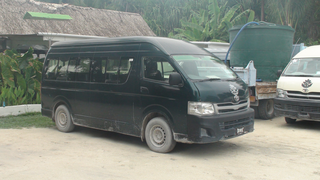 Around South Tarawa buses are the most convenient and inexpensive way of travelling. A fleet of private buses service Betio to Buota. Car rentals are available on South Tarawa. Buses and vans are also available for private hire. You can only access the Phoenix Islands by sea. You must have your own vessel, charter a vessel or join an adventure sailing cruises to visit this region. Ships operate from South Tarawa to Kanton. Kanton Island is accessible via a private flight or sea. Ships operate from South Tarawa to Kiritimati. Around Kiritimati there are small fleets of privately owned buses that are convenient to use. It is also possible to hire and rent vehicles.